I really appreciate the replies and votes from yesterday, thank you! I will keep on in my multi-faceted way and hope to bring something interesting to the cosmetic blogging world. I point you all again toward my blogroll: there are some crazy talented peeps up in there. So, housing! I’m a roleplayer; I like immersion in my game environments. I’m also gleeful and giddy about the fact that an f2p account = a house. Seriously, it’s fantastic. Make an account, level a character to 15, buy a house (and a chest in which to put non-bound cosmetic clothing, I might add). 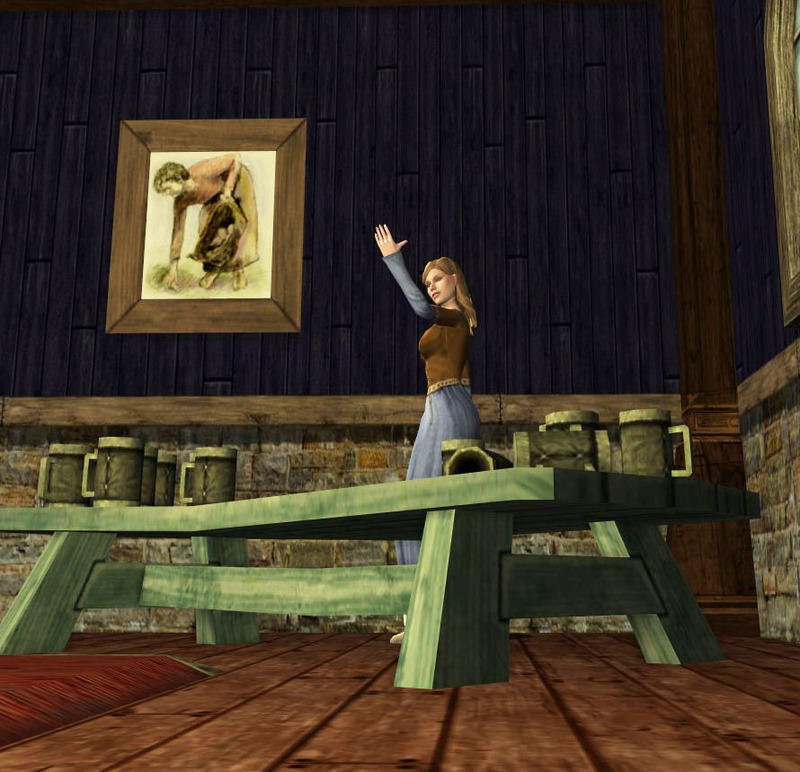 I giggled a lot when I read about a LOTRO player who gathered and decorated a dozen houses. A dozen. If you’re just getting your first LOTRO house, Casual Stroll to Mordor’s housing guide is a great start. It isn’t wholly up to date, but for everything before the Great River update, it’s fantastic. Really, click on “Housing” at CStM in general, and you’ll find all sorts of stuff worth reading. If you want to be slapped sideways by cute, check out Kiarane’s amazing Children’s Room post. If you’re a veteran decorator, what are other sites you’ve used as inspiration or example? My first bit of advice is: Figure out what you want. Are you roleplaying a healing-hall, a Hobbit tavern, a warrior’s home, a noble house, a Rohirrim mead-hall (no, really), a Dwarven family’s halls? A theater, a music hall, a place to show off your raid trophies? For example, I made up a little vignette for this post based on a dark and tiny village tavern meant for laborers and farmers. Simple, rustic furnishings and the Innkeeper’s Dress set the tone. 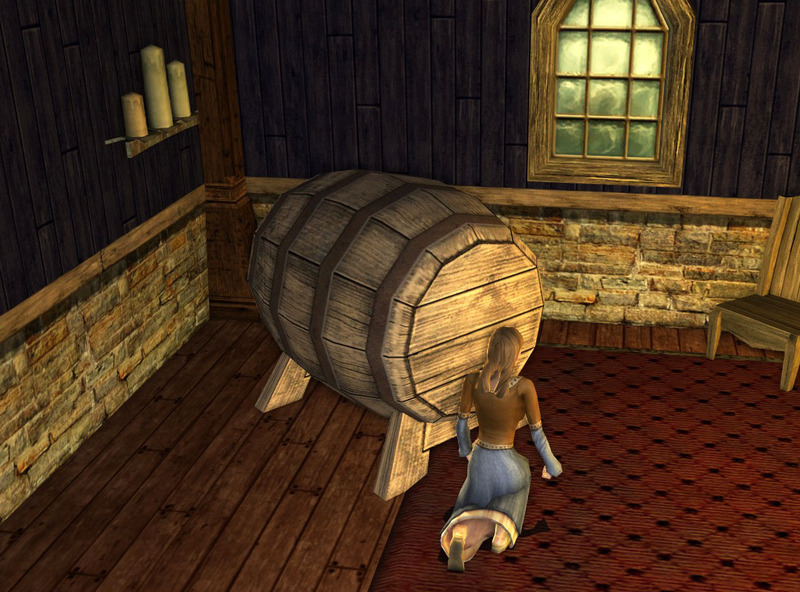 The game offers a few different keg designs, but for a poor country watering-hole, the Wooden Keg works just fine. Our model serves behind the Spring festival barter reward, the Clover Table. Tomorrow, a new Seen on the Streets!